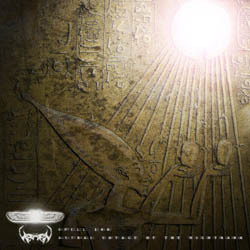 Blackened Ancient Egyptian occult space metal project The Horn from Australia has just released its new work, available online in its official Bandcamp page. The Horn is the personal project of A Demon Sheen, who formed it back in 1997! His aim is to set the whole “Ancient Egyptian Book of the Dead” to music. All lyrics are taken from translations of the book by R.O. Faulkner. So far he has released 12 full-length “Volumes” with many of these spells. The new album included only two songs, the psychedelic epic “Spell 140” and a dark intergalactic voyage on the Nightbark. Although “Spell 140” will most likely end up re-released on a proper “Volume“, the 36-minute space-ambient noise piece “Astral Voyage of the Nightbark” will most likely not be available in any other form.